Throughout World War II, the M1 Garand rifle, which was manufactured in large quantities, served the U.S. Army extremely well. Despite the Garand’s undeniable reliability and effectiveness in combat, the experience of the German Gewehr 43 and the Soviet Tokarev SVT-40 semi-automatic rifles showed that the eight-round, clip-loaded magazine of the Garand was a significant weakness because of the inability to load single cartridges or reload mid-clip, in contrast to the box magazines used with the German and Soviet weapons. The Army’s concern with the concept of “Greater Firepower, Lighter Weight” reverberated from battle reports emphasizing the need for efficient, lightweight automatic small arms. Experience from the M1’s exemplary performance combined with the effectiveness of the .30 caliber Browning Automatic Rifle (BAR) made the idea of combining the best features of both weapons into a single versatile rifle a high priority after the war. As early as May 1944, the Army began searching for a weapon for airborne units that would provide the relatively lightweight and select-fire capability of the standard carbine but would offer the killing power of the Garand. The Springfield Armory was assigned the responsibility of combining the aspects of both weapons into an efficiently operating rifle acceptable to the combat forces. The concept resulted in the development of the T20 series rifle. The development of the T20E2 saw the innovation of the twenty-round box magazine, a longer receiver that allowed time for a cartridge to feed upward in the magazine, a selector and connector that permitted full-automatic firing, a flash suppressor, and a roller on the bolt-operating lug that allowed continued functioning despite external elements such as rain, snow, and dust. Despite these new modifications, the rifle still resembled an M1 rifle with a box magazine added to it. The arms industry and Army Ordnance developed several rifle designs, all of which utilized the then-standard American .30-06 caliber ammunition. However, as work on an agreed-upon design continued to evolve, the main goal of the Army changed as well. The Army sought a new rifle that would be used by all infantry soldiers. Several subsequent experimental designs, including the early T20 series, failed to take into account the pursuit in the early 1950s by the North Atlantic Treaty Organization (NATO) for a standard rifle cartridge that all NATO armies could use to avoid the logistical problems that would be encountered during a war if allied armies in the same theater were equipped with different ammunition. As a result of this new push for standardization of ammunition throughout the alliance nations, Army officers insisted that any standard NATO round would have to prove acceptable to the U.S. Army and equal or exceed the performance of ammunition then in use by American soldiers. After extensive debate, NATO adopted the T65E3 cartridge as the new 7.62mm NATO round in December 1953. About the same time, the T44 series rifle was being tested and perfected. The original rifle of the series incorporated many features that were to be found in the final model. In addition to using the T65 ammunition, the rifle featured a prong type flash suppressor and an automatic pressure relief valve for launching grenades. The rifle was also equipped with a modified M4 bayonet originally used on the M1 carbine and featured selective semi and full-automatic fire with a lightweight twenty-round box magazine. After further tests and minor modifications, the T44E4 earned the final designation as the Rifle, 7.62mm, M14, in June 1957. The final product was about two pounds heavier than the M1 Garand, but was far more accurate and reliable in tests. The M14 was subjected to extremes of weather and hard usage throughout its five years of extensive testing and constant modification. Scientific abuse tests, which were conducted in heat, cold, dust, and water, far exceeded conditions normally encountered in the field. During sustained fire tests at Fort Benning, Georgia, an M14 was fired continuously at sixty rounds per minute for 3,080 rounds. The test ended after fifty minutes because chambered rounds were being ignited by the hot barrel. The Army awarded contracts to Winchester and Harrington & Richardson to begin manufacturing the M14, but shortly after production commenced, several M14s burst apart in firing range tests. Consequently, the service entry of the M14 was delayed due to the need for further tests to resolve the problem. The rifle continued to face technical and financial problems even after an improved version of the M14, the M14A1, was adopted. A second round of production orders, including some to a third manufacturer, Thompson-Romo-Wooldridge, Inc., was a solution to the problems the industry had with production of the M14. However, the issues of cost, weight, and reliability were still subject to debate into the early 1960s, years after the rifle entered service. One particular technical problem was that the M14 was almost impossible to control when fired in automatic mode. Some soldiers even claimed that the M14 basically became an “anti-aircraft gun” after a few rounds of firing on automatic due to uncontrollable barrel climb. As the M14 continued to receive criticism, the U.S. Air Force began issuing its security personnel a new rifle that would eventually become the M16. With the war in Vietnam escalating, the new M16 seemed increasingly appropriate. Although the M14, firing the NATO 7.62mm round, was more powerful and accurate, the M16 could spread bursts of automatic fire over a wide area more rapidly than the M14. Furthermore, the M16 fired a smaller, lighter 5.56mm round, allowing soldiers to carry more ammunition into combat. 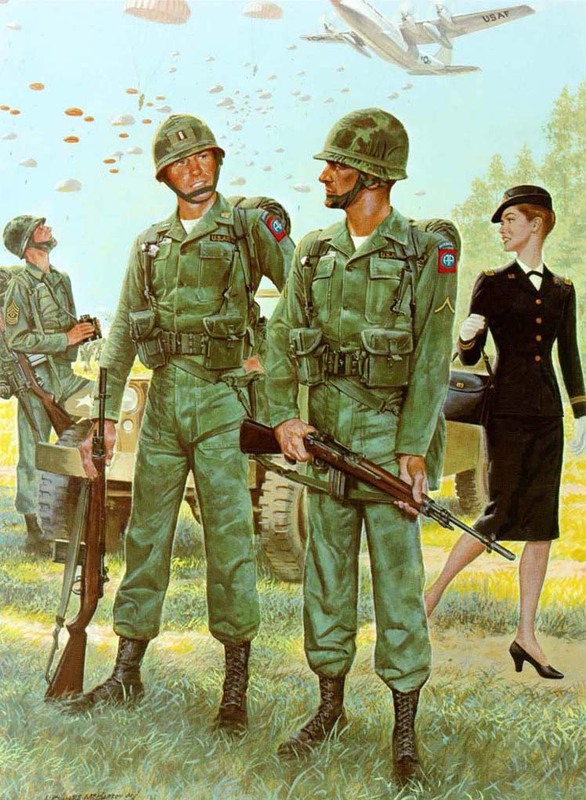 Finally, Army doctrine of the early 1960s began emphasizing firepower and rapid-fire techniques to marksmanship. As a result, Army Ordnance officials began evaluation of the Air Force’s weapon. The M14’s service in the Army was cut short when Secretary of Defense Robert McNamara ordered a halt on production of the rifle on 23 January 1963, after more than one million had been manufactured. 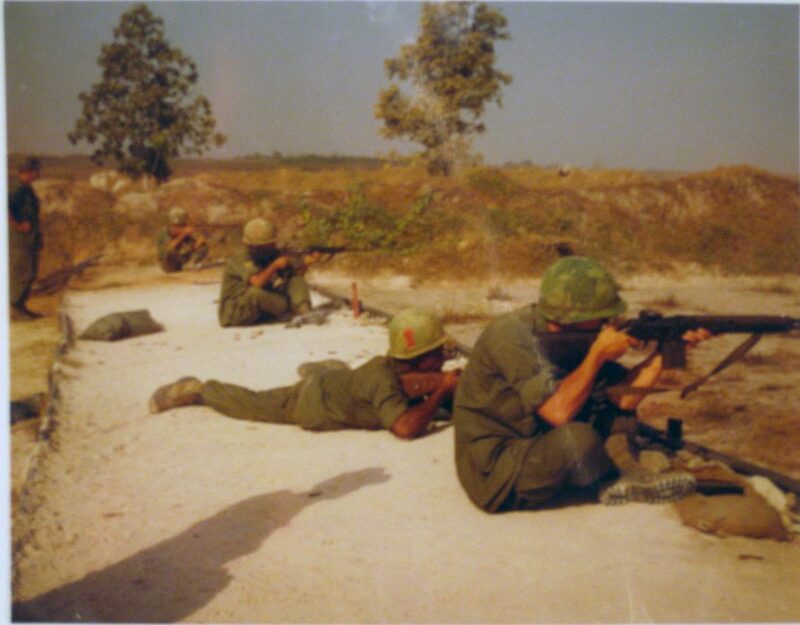 Although the M16 became the Army’s standard rifle, many soldiers, disgruntled at the decision, managed to retain their M14s after they were deemed a limited standard weapon. The U.S. Marine Corps was even more reluctant to give up their M14s. Some M14 supporters felt vindicated when jamming plagued early models of the M16 in Vietnam, although later modifications and instruction of proper cleaning procedures largely eliminated any problems with the M16. 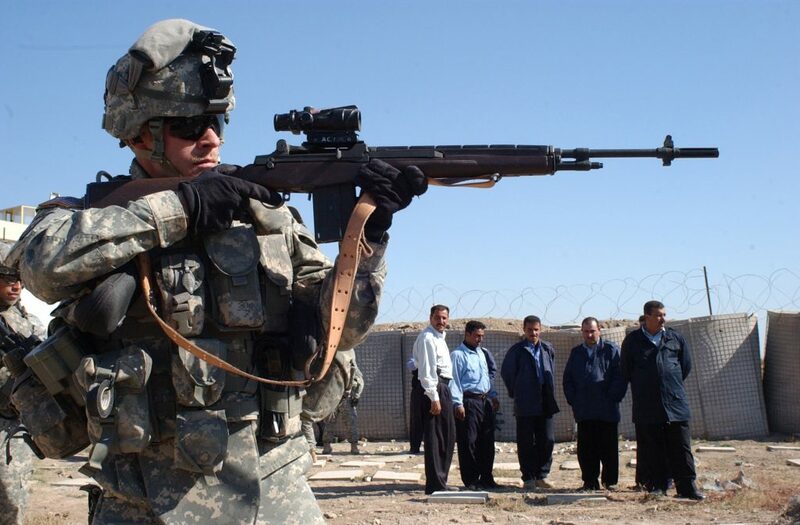 Sergeant First Class Richard Wiley of Company A, 3d Battalion, 509th Infantry, aims an M14 rifle during a training demonstration for Iraqi policemen, 17 November 2006. (Photograph by Specialist Olanrewaju Akinwunmi, courtesy of the U.S. Army). 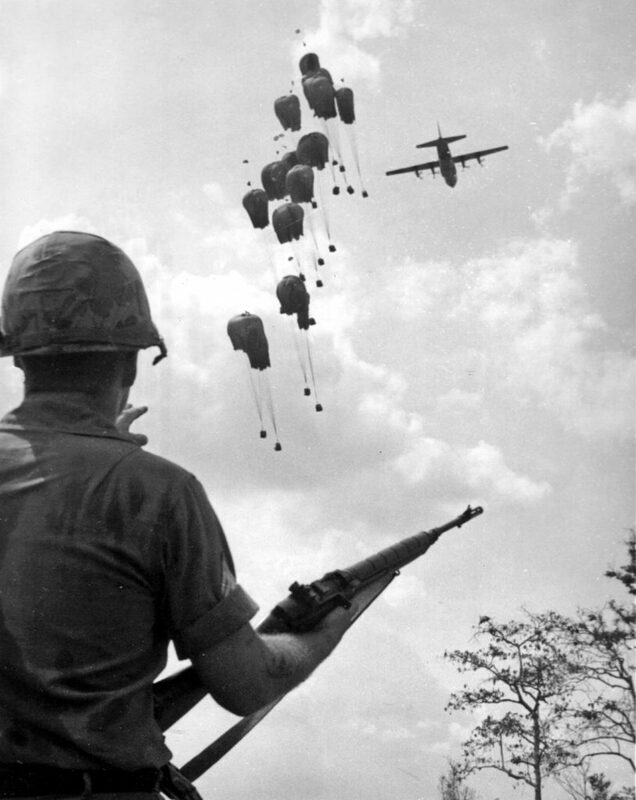 With the adoption of the M16, the Army gradually phased out the M14 during the Vietnam War. The rifle remained the standard weapon for U.S. Army basic combat training and for troops stationed in Europe until 1970. 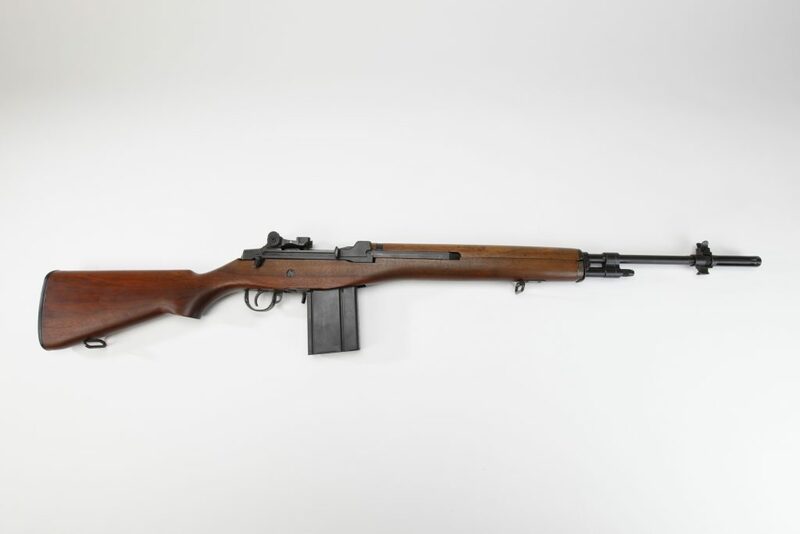 Despite its short service during the late 1950s and into the early 1960s, the M14 continued to prove itself in various rifle shooting competitions, and the design persuaded the Army to investigate the use of the M14 as a sniper rifle due to its excellent accuracy and effectiveness at long range. An M14 used by trained hands can be effective up to a distance of 800 meters. Special Operations forces have adopted the M14 sniper variants, notably the M21 and M25, as designated marksman weapons. One of the most notable examples of the use of the M14 is by Special Operations soldier Sergeant First Class Randall Shugart during the Battle of Mogadishu in October 1993. Shugart, along with fellow Special Operations soldier Master Sergeant Gary Gordon, were both awarded the Medal of Honor posthumously for their efforts to secure the crash site of a downed MH-60 Black Hawk helicopter. The 1st Battalion, 3d Infantry Regiment (Old Guard), which is assigned to the Military District of Washington, is the sole remaining infantry unit in the Army to be issued the M14 as the standard rifle. The Old Guard uses the M14 for ceremonial events, and Tomb Sentinels carry them while guarding the Tomb of the Unknowns in Arlington National Cemetery. U.S. Army Special Forces continue to use the M25 variant, but they were issued to spotters in sniper teams after the Army adopted the M24 bolt-action rifle as the primary sniper rifle. In Iraq and Afghanistan today, M14s are still used on the front lines by the Army, often as a sniper weapon, because their effective power, especially in urban settings, and their reliability in the rugged, sandy conditions found in Iraq and Afghanistan.